The Cake was created by baking two 12 inch round cakes stacked for the base tier, two 8 inch by 8 inch square cakes stacked for the middle hay stack tier, and three 6 inch rounds for the top pumpkin tier. I cooled and froze them for a few hours to make the cake firm making it easier to carve into the pumpkin shape. After the cake was carved I frosted it and then placed cake back into the refrigerator until I was ready to frost again, this time making sure it was a thick even coat of frosting so that the fondant could be applied giving the cake a nice smooth finish. 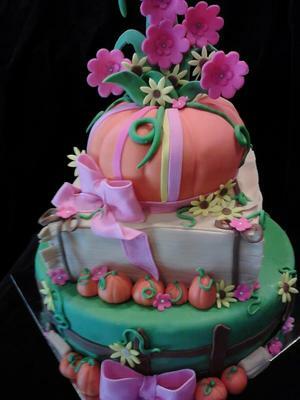 The creases in the pumpkin were made on the pumpkin by softly indenting cake with a narrow paintbrush...just dragging the part that you would usually hold down the side. All of the cakes were cooled for about an hour before being frosted. I then frosted and applied the fondant on all of the cakes cakes. The flowers and bows were all made from gum paste. The small pumpkins, small hay stacks and all other decorations were made from fondant. They were all attached to the cake with a dab of water. The entire Cake was completely edible. I love your cake, it is so beautiful. You did a great job, nice and clean. Love it.